Every year the st week of the month of May is recognized as the International Week of the Disappeared. This week provides an opportunity to commemorate the disappeared, and acknowledge the struggle of their families. It is also an occasion to recommit to the fundamental right not to be disappeared, the right to know the truth and the right to justice and reparation. It is an occasion to continue to demand that governments sign, ratify and implement the International Convention for the Protection of All Persons from Enforced Disappearance. The Convention presently has 95 signatories and 52 State parties and has come into force on 23 December 2010. Recently, after Philippines, the government of Thailand ratified the convention and has decided to enact a law criminalizing enforced disappearances. The Indian State continues to remain in denial of the ongoing international movement against enforced disappearances. It has signed but not ratified the Convention against disappearances. Following the commission of widespread and systematic enforced disappearances, the Indian State has chosen to protect itself and its own forces by disregarding the very existence of the crime itself. APDP has documented 1536 of enforced disappearances. According to conservative estimates, and extrapolating from existing documentation, more than 8000 people have been subjected to enforced disappearances in Jammu and Kashmir since 1989. There are 7000+ unmarked and mass graves in Jammu and Kashmir. Despite a consistent campaign in Jammu and Kashmir against enforced disappearances for 22 years, no action whatsoever has been taken. No Commission of Inquiry as demanded was set up, no investigations and no prosecutions have been made due to continued legal impunity in Jammu and Kashmir. The connected issue of unmarked and mass graves in Jammu and Kashmir, which was recognized by the State Human Rights Commission [SHRC] in 2011 [2156 graves in three districts of North Kashmir], and the European Parliament in its resolution in July 2008, has not been addressed by the government. The government has refused to accept the recommendations of SHRC for investigations into the unmarked and mass graves. Ongoing complaints by APDP of 3844 unmarked and mass graves in Poonch and Rajouri districts, and 507 cases of enforced disappearances from Baramulla and Bandipora, and 132 cases of enforced disappearance from Banihal, remain pending as the SHRC has become defunct. This is in addition to numerous other complaints in individual cases of enforced disappearances. While the government is constantly concerned with schemes under the garb of “development” and “social welfare”, the issue of enforced disappearances is completely ignored. Since 2012, through reports and campaigns, APDP has begun concerted work on identifying and shaming State personnel accused of crimes including enforced disappearances. Most recently, in September 2015, APDP was part of a report titled “Structures of Violence…” wherein 333 crimes were analyzed in which 972 alleged perpetrators were identified. Of these 333 crimes, 73 were related to enforced disappearance. Most importantly, this report specifically named and shamed those accused of enforced disappearance. This is an important exercise not just in the legal struggle against enforced disappearance but also as a part of a larger social movement against this crime. While the families of the disappeared spend every day remembering the disappeared, the State actors are moving on with their lives with no sense of shame, guilt or accountability. A part of this important report was also the identifying of 189 accused government gunmen / counter-insurgency forces known as the Ikhwans. Many of these gunmen, never formally associated with but directly controlled, funded and armed by the armed forces, continue to remain in our society despite being accused of crimes including enforced disappearance. One example is that of Ikhwani Rasheed Khan, a commander in the Kupwara area, responsible for reportedly more than scores of killings/disappearances and widespread extortion. Continuing from its past work, APDP today pledges to focus this year on these government gunmen responsible for the crime of enforced disappearance, raise awareness in our society about the role of these gunmen, and continue to support the legal struggles of families before the various courts and also seeking moral accountability from government sponsored gunmen. The campaign on the Ikhwan is an attempt to turn the spotlight on the crime of enforced disappearance itself and the everyday violence that the families of disappeared face, including by having to live with those responsible for disappearing their loved ones. 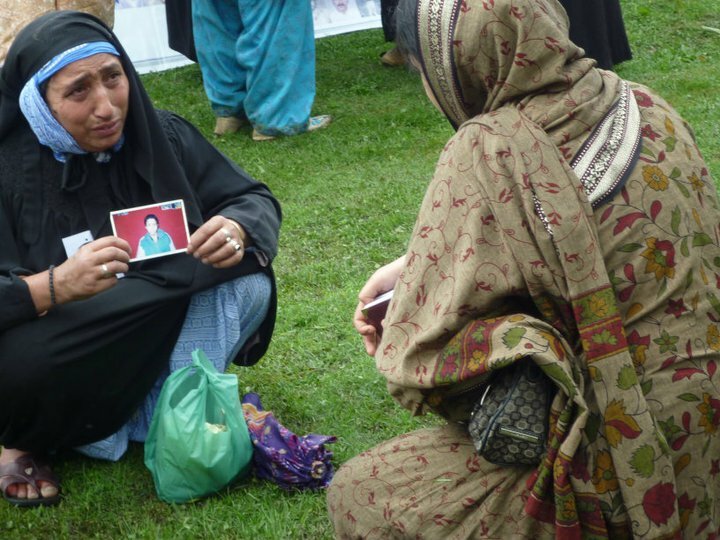 Since the federal and state governments of J&K have ignored the plight of more two hundred thousand relatives of the disappeared people, therefore it is the responsibility of international community to intervene and hold the government of India, a claimant for permanent in the UN Security Council, accountable for more than 8000 enforced disappearances in J&K.